The customer service is AWESOME! Felix and Joe make you feel like part of the family and extends to the company! I will use them again and definitely recommend/ refer! Thank you for making such an icky situation a quick one! Thank you!!! Outstanding customer service- very professional, informative, and sense of urgency to help us with repairs in a timely manner. I would recommend! I want to thank and definitely recommend George K and his partner Joe. I’ve had service from other company’s but this one was far superior. George and Joe are a great asset to this company. They were clean, courteous, but most of all honest! When they told me my problem could not be repaired they didn’t try to sell me a lot of things I didn’t need. I was given the facts about their products and a up front estimate and they honored the price quoted. For great service call The Pink Plumber and ask for George K and Joe. You will definitely be pleased with these gentlemen! I highly recommend The Pink Plumber in Tampa. They sent an excellent service gentleman named Thomas. He was friendly, knowledgeable and very patient. I ordered a kitchen sink and faucet for him to install. When he brought the faucet I didn’t like it. He gladly let me pick out a new one. He had to make many trips to my home and his drive was 45 minutes away. He gave 100% customer service. By far the Best Plumbing Company ! From the beginning phone call to follow up was prompt courteous and accommodating. Dave was very friendly and compassionate to my situation and the repairs I needed. He gave me options for my repairs which I appreciated. I would recommend Pink Plumber and Dave to anyone! Thank you for your service! We had the unfortunate experience of having a shortage in our water heater on a Saturday with family arriving the following Sunday. My husband called The Pink Plumber and Robert Potochney was dispatched to our house. While the water heater had to be replaced, Rob went over and beyond the call of duty, found the problem and temporarily fixed the water heater until it could be replaced. Rob did all the work in getting the water heater replaced and even took it to a Rheem dealership and exchanged it for a new one for my family. You can tell that he cares for his clients and has their best interest at heart. Excellent person and employee. The company is blessed to have him. Marat was great. He explained all the cost and process of the work. He quickly got to work and finished. George K. is one of the most knowledgeable plumbers I have ever met. He has helped me with my refrigerator, faucet and garbage disposal. Any time I need help, I’m only calling him. Mike Seales and Thomas are very professional, they did great work. Mike is an awesome leader and mentor for Thomas. He was very respectful. Felix was professional, kind, patient, knowledgeable. He was honest in regards to repairs that should be a priority versus repairs that could wait a little. His work was efficient and clean. I would definitely request him again! Great service! I highly recommend pink plumbers!! Arrived early/ waited for me /clean/neat/helpful / satisfied! Quick and friendly. Very helpful and thorough in their explanations. He was pleasant and patient with me. He explained what he was going to do, then showed me after he did it and why. In the future, if I need a technician to come out for any reason, I would ask that he be the one to be assigned to my home. Thomas did a great job! We will be calling again should we ever need a plumber in the future. Couldn't ask for a better serviceman!...he was professional, kind, polite, caring and definitely knew what he was doing...didn't plan on the price but who does...I would ask for Thomas again...without a doubt...a credit to his profession. Let's begin with Tech Mr. Salvato. Very nice to work with, knowledgeable and accommodating. A copper pipe had sprung a leak inside a wall in my garage. Mr. Salvato showed up on a Saturday and tried as much as he could but couldn't locate the leak's exact location, expected, I guess, because the leak was behind the wall. So, he called for a leak specialist who couldn't make it until the next morning (Sunday.) The leak specialist found the leak in short order. He replaced a 12-inch section of copper pipe from which the leak came. It took him, I am guessing, around 20 minutes or so to do the repair. It looks fine. Now, let's examine the costs. I realize Mr. Salvato came out on a Saturday and I expected to pay a little more. He spent around an hour or more searching for the leak, which involved cutting two holes in the soggy fiberboard and drilling out a section of concrete footing. Therein lies my problem — the cost. I mentioned I expected to pay more for a Saturday visit, but more than $400? So, on Sunday the leak tech came out and found the leak in short order and replaced a 12-inch section of copper pipe. I am guessing he spent a short time searching for the leak and spent, I am guessing, 20 minutes on the repair. The cost $461.00. Originally Mr. Salvato quoted me $400 plus another $100 for Saturday’s visit and the Sunday leak repair. I paid $521.88 on Saturday that included, he said, the additional $100 for the leak test on Sunday for the total of $521.88. On Sunday, the priced changed. He told me the leak test and repair would be around $460 additional. I argued with him and told him we agreed Saturday the total would be $521.88. He said that was the best he could do. I said never mind I was going to get another opinion on the repair and after going back and forth arguing about the price, he dropped the price by $200. Why didn't he quote me that lower price originally? Bait and switch? He asked me if I would like to have a restoration company estimate the cost of restoration, a company he works with. I said yes. The restoration company came out Sunday to review the situation. The tech was very nice and said she would sent me a quote my email Monday morning. I said fine, and that I was going to get one or two quotes. She said that was fine with her. Mr. Salvato looked disturbed shook my hand and left. The restoration clerk said he was quite mad. I said I noticed that, too. She said he probably was upset because he wouldn't get credit for the referral of her company. First, I always get more than one quote for any work I need. It is the proper thing to do. Second, as a journalist we do not trust anyone, because we have been lied to so many times. There is an old saying among t journalists: If you mother tells you something is fine, check the facts. Third, I do not like to be rushed into my decisions. That is one of the reasons I would not recommend this company. Bottom line, I paid a total of $824.69, not including the restoration and replacement I have coming up next. In my opinion this plumbing company's prices are exorbitant. I don't mind paying my share but to quote a high price and then lower it because of pressure from a customer is dishonest. The Pink Plumber's are quick & courteous! I highly recommend them!! Especially my service Pro Thomas S. He was Amazing!! I will definitely use them again if the need arises!! Best experience I've ever had with a Plumber! Called the evening before and had they had TJ and Rick there the next morning at 9:30. They were very professional and pleasant. Very knowledgeable in what they were doing! Thomas was excellent. I had water coming in through my ceiling. He found and fixed the issue and even called the water restoration company for me to come out and make further repairs. He was very curteous and professional. Excellent he is wonderful and very professional!!!!!!! Thomas Salvato (TJ) did an awesome job with our plumbing project... he replaced two of our toilets. He was knowledgeable, thorough, very nice to my children, and talked through all the details with me. I'll definitely be calling him again when we need a plumber! I was very pleased with the work ethic and how professional Thomas conducted himself. I would recommend him and definitely call him for future needs. Thomas S. came in did the estimate, kept me updated as to the progress, was totally professional, and did a fantastic job. I will use him and the Pink Plumber. I will definitely call Pink Plumber for future needs. The dispatcher called to advise of arrival time. Thomas arrived on time and his assistance was excellent. He was able to diagnose the problem and fix efficiently while explaining the job needs and cost for my approval. This is one of the best experiences I have had with plumbing services. This was the first time that we used the pink plumber. The technician Thomas salvato did a great job. He took the time to show me the issue and what he would do to solve it. He provided a quote ahead of time so there would be no surprises. Overall I am highly satisfied with the customer service. Water heater leaking. Sunday. Super. Found pinkplumberfl.com, 24/7, no apparent overages for weekend service. Customer svc associate was friendly and was able to schedule a plumber within an hour or so. TJ arrived and assessed the situation. He provided 3 options. After I selected one of the options, he provided a quality job , materials and a clean work space. Other than the new materials, you would not have known he had been there. I may have been able to get a lower price through other means, but I called for a professional plumber and I received one. I paid for quality and I received it. 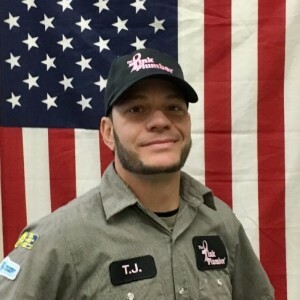 Thank you TJ ! TJ was awesome! The visit was way too expensive, though.